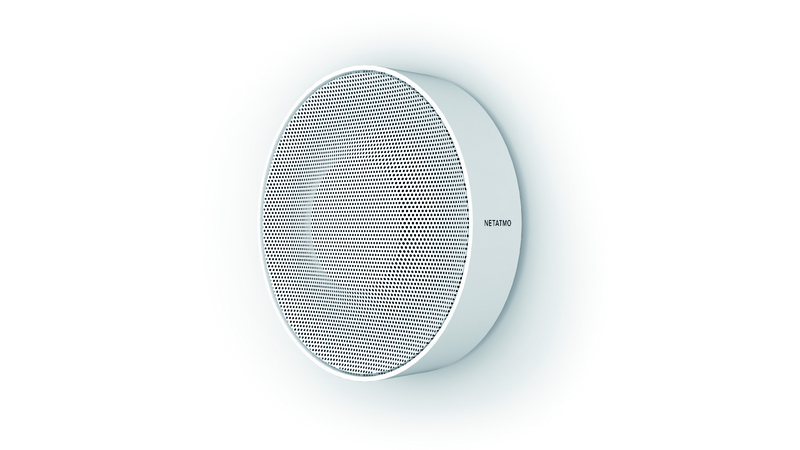 French hardware company Netatmo is announcing a bunch of new products for your home. Interestingly, some of these products go beyond the usual connected lightbulbs and cameras. With a brand new approach and a wide range of products, Netatmo is slowly but surely becoming one of the most prominent advocates for the smart home. Let’s have a look at what they have in store. First, the company is announcing two new security products. In addition to the indoor camera, outdoor camera and door tags, Netatmo is adding a connected smoke alarm and a security siren that you can pair with your Netatmo Welcome camera. The smoke alarm complies with the regulations and is a bit smarter than your average smoke alarm. It connects to your Wi-Fi network to send an alert to your phone. It works with Apple HomeKit and IFTTT. More interestingly, Netatmo is using the battery very sparingly so you can leave the device alone for up to 10 years. Given that authorities recommend you change your smoke detector every 10 years, that’s a nice feature. The security siren is quite simple. It communicates with your Netatmo Welcome camera using Bluetooth Low Energy to emit a loud alert if there’s an unknown person. You can put it on the ceiling so it’s hard to reach. Second, Netatmo is partnering with well-known brands for more ambitious devices. “Our strategy is the connected home. But there are some connected features that we can’t sell to consumers because those products are sold to professionals directly,” Netatmo founder and CEO Fred Potter told me. That’s why the company is partnering with existing brands to connect everything in your home. The two first partners are Velux and Legrand. Legrand is the world’s leader when it comes to switches and sockets. The new Céliane with Netatmo switches and power outlets will be sold by Legrand and will make your electrical installation smarter. For instance, you could have a wireless master switch near your door so you can turn off all the lights, activate the security camera and more. It’ll make it much easier to control devices with Amazon Alexa, Siri or IFTTT, as you won’t need the smart version of all your appliances. As for Velux, the company partnered with Netatmo to ship connected windows with a bunch of sensors. If it gets warm, the window can close the shutters. If you just took a shower, the window will automatically open. If it’s a warm summer night and it’s actually colder outside, the window will open. I’m not sure why exactly, but I find this connected window much more interesting than 95 percent of smart home devices. All devices will ship during the second half of 2017 for undisclosed prices. I’m still not fully convinced that the smart home is going to be a revolution. But Netatmo is well-positioned if it happens.